Know the email address of a missing 610 MASS Alumni? Click here to contact them! An * in front of a link indicates the link is viewable only to members who are registered and logged in. Click on "610 MASS". This website is dedicated to all personnel who served in the 610 MASS at Yokota AB, Japan. Please join us by filling out your profile so that you can gain access to the complete website. We're in the process of building this site for you to visit and enjoy so please be patient as we develop it and come back often to look for new updates. The 610th Military Airlift Support Squadron (MASS) was activated on 8 April 1966 and deactivated on 1 October 1978. Its mission was to provide direct support to the Far East which included Vietnam , Japan and Korea. It handled approximately 126,000 passengers and 16,000 tons of cargo a month. (Ref: Stars & Stripes 07/23/69) It also earned six Air Force Outstanding Unit Awards. Our members were very proud to support the air evacuations of the wounded from Vietnam, many of which had been wounded only hours before being evacuated. It was also a great honor to support the aircraft bringing back the brave members of the military who had given their lives. All of our members supported these missions tirelessly, in many different ways, and would do what ever it took to see that they were successfully accomplished. Go to your profile and indicate if you’re thinking about attending next year’s reunion or not. It will give us a rough estimate on the number of members planning to attend. We now have copies (150 weeks) of the 1969 through 1971 weekly Afterburner & FUJI FLYER Yokota base newspapers available for you to look at. Sign in and look at “More Information” on the left side of this page for information on how to access them. Over 390 610 MASS folks are on our Facebook page. You can find us @ Friends of 610MASS (Yokota AB Japan) This is the link. Join us. We need your help in locating other members of the 610 MASS. We've added a page on the left hand side titled "HELP US FIND THEM." It has partial information on members. We need additional information on. See if you can help us. 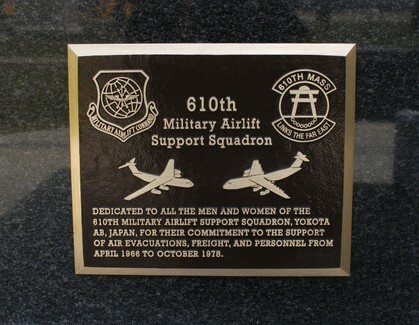 If you ever get a chance to visit the National Museum of the United States Air Force at Wright-Patterson AF Base in Dayton, Ohio be sure to take a look at our plaque, see above, which was dedicated on September 28, 2005. 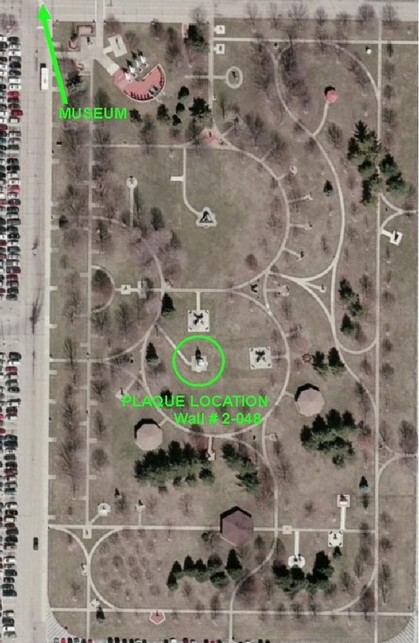 It's located in the Memorial Park on Wall #2-048. See picture below for the exact location. and use the password to gain access.